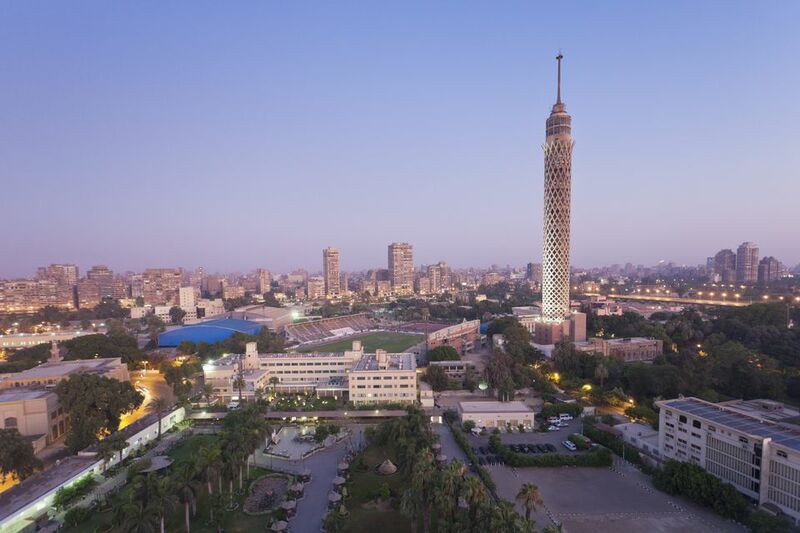 Also known as Borg Al-Qahira, Cairo Tower is a free-standing tower located in the Gezira district of the Egyptian capital. It presides over Gezira Island in the middle of the River Nile, and is Cairo’s most recognizable modern monument. At 614 feet / 187 meters tall, it’s the tallest structure in Egypt and North Africa. Up until the unveiling of the Hillbrow Tower in Johannesburg in 1971, it was also the tallest building on the African continent. It has a total of 90 floors, and measures 46 feet / 14 meters in diameter. Today, the tower is used for observation and communications, and is one of Cairo’s most popular tourist attractions. Cairo Tower was designed by prominent Egyptian architect Naoum Shebib, and completed by a team of 500 workers. Its latticed design is inspired by the lotus plant, a popular motif used by the Ancient Egyptians to symbolize the sun, creation and re-birth. Similarly, the tower’s base and main staircase are carved from polished pink Aswan granite, a material frequently used by Ancient Egyptian architects; while the tower itself is made of reinforced concrete. On the outside, a coating of 8 million tiny mosaics provides protection from the elements. Construction started in 1954 and finished in 1961. For three of those years, work was suspended due to the outbreak of the Suez Crisis. After the tower’s completion, Egyptian President Gamal Abdel Nasser revealed that funds for the building had come from the Government of the United States. This was not the Americans’ intention: the money was a $6 million gift to Nasser intended to encourage him to end his support for the Algerian struggle against French colonialism. Offended by the bribe, Nasser used the money to build the tower as a symbol of Arab resistance, located just across the river from the U.S. Embassy. In 2004, a five-year restoration project was carried out ahead of the tower’s 50th anniversary. Although the goal of visiting Cairo Tower is obviously to get to the top, the circular entrance lobby is an attraction in its own right. A mural of mosaics depicts landmarks from around the United Arab Republic, the sovereign state formed by the brief political union of Egypt and Syria from 1958 to 1971. These landmarks include the pyramids of Giza, Cairo’s Salah al-Din Citadel, the Umayyad mosque in Damascus and the water mills of Hama. Like the tower itself, the mural was intended as a clear representation of Arab pride and offers an insight into the region’s political landscape in the second half of the 20th century. After exploring the lobby, ride the elevator up to the circular observation deck at the top of the tower. Here, a 360º panorama awaits, affording unrivalled views of the Greater Cairo area. On a clear day, it is possible to see all the way from the Muqattam Hills at the capital’s eastern edge to the pyramids and the start of the Sahara Desert in the west. Below, the River Nile flows around both banks of Gezira Island and on through the city as it has since its foundation by the Fatimid dynasty in 969 AD. Telescopes are provided for those that want a closer look at Cairo’s prominent landmarks. On the floor directly beneath the observation deck, Sky Window café serves light refreshments at relatively affordable prices, and is a great place to sit and soak up the view during the day. For a ritzier dining experience, book a table at the 360 Revolving Restaurant. Turning one full revolution in approximately 70 minutes, the restaurant was a favored dining destination for President Nasser, as well as a sparkling roster of 20th-century politicians and celebrities. Katherine Hepburn was the first Hollywood star to visit. Today, the restaurant serves pricey European and Egyptian cuisine, and though there are better restaurants in nearby Zamalek, the view from this one cannot be beaten. Cairo Tower is open every day from 8:00am until midnight, and until 1:00am in summer. Tickets are priced at 60 EGP per person (while children under 6 years old go free). The best time to visit is either in the late morning after the early haze has burned away; or in the evening when visitors are greeted by the spectacle of a million lights sparkling into life all over the city.